Roy or a Reg ??? ROY AND REG - ROLE MODELS FOR A WAYWARD GENERATION? Roy and Reg are not celebrities, they are not superheroes and they are not film idols. Roy and Reg are not ostensibly remarkable in any way shape or form but they are everywhere. You might be sat next to one at work, or maybe pass one in the street without even noticing him. Come to think of it, you may be one yourself, yet be blissfully unaware of it. In short, Roy and Reg are blokes-just average geezers bumbling through life and having adventures. What sets a Roy - or indeed a Reg - apart from the rest of Joe Public is his attitude towards life, his philosophy if you will. In this day and age when "looking after number one" seems to be paramount, Roy and Reg take a generally more altruistic stance without letting this affect the amount of fun they have in any way, shape or form. Roy is kind and considerate; he is a devoted father, husband or son and a reliable and trusted friend. He is also karmically aware and does unto others as he would have done unto himself. This is not to say though that he spends his life wandering around in search of old ladies to help across the road nor, indeed, does he spend his time at parties exclusively in the kitchen. Roy and Reg are equipped with an unrivalled capacity for fun and possess a joie de vivre that would sometimes make Hugh Heffner as green as one of his more lurid smoking jackets. 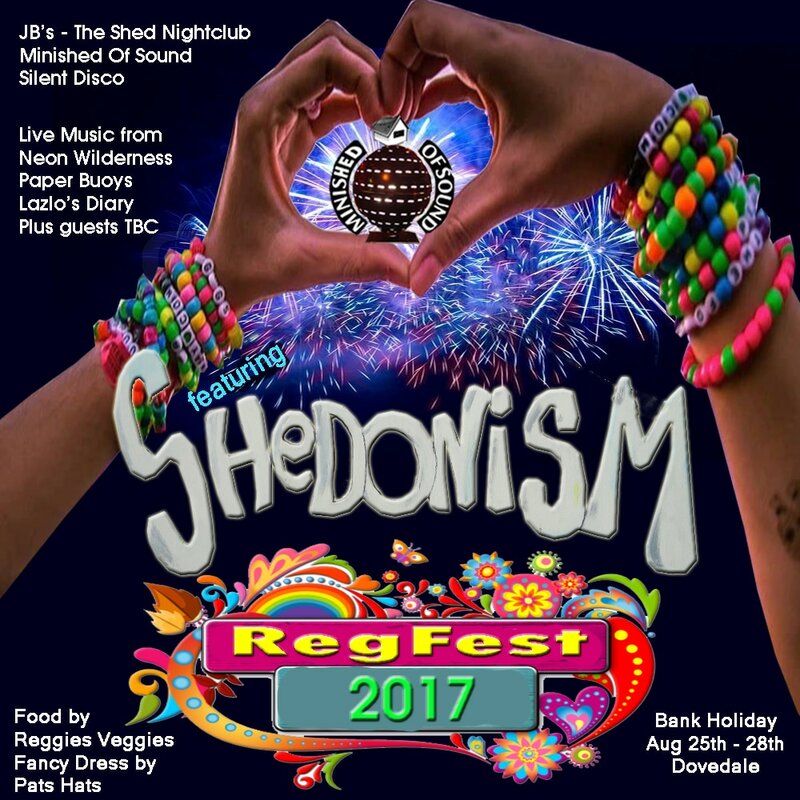 They are not afraid of starting a party on Friday and ending it on Sunday, nor indeed would they baulk at the idea of starting a party in Birmingham and ending it in the South of France. Roy and Reg live life to the full, and in so doing enjoy the rewards that this philosophy can bring. So if you read this and think, "That's my bag baby!" then let us know about it. Take your time to peruse our site and immerse yourself in the global phenomenon that is Roy and Reg. Write to us; regale us with stories of hedonistic adventures and lost weekends, give us heart-warming tales of camaraderie and bon hommie, or simply tell us what being a Roy or a Reg means to you. “Whats Going on Reg”? 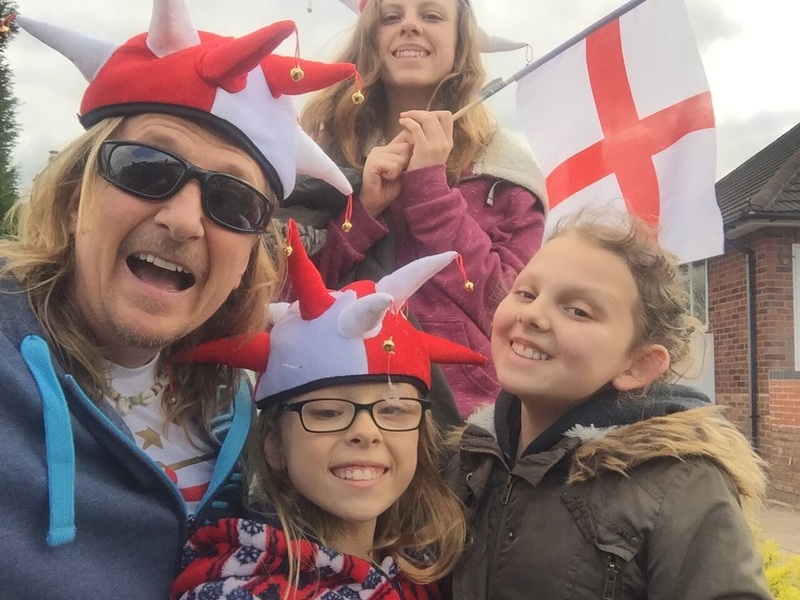 I said wearing my England Hat and carrying St George Cross flags, "happy St Georges Day"
Brought in preparation for the Euro’s and we gave them an early outing on St Georges day this year. The shed stood part assembled in the back Garden of Reggies home. “We should take it took Glasto mate” I flippantly remarked. From that moment the Shed took on a life of its own. Over the next few months Reg would add to it, the roof became fully waterproof, something that especially this year would be crucial.. Almost weekly deliveries from Amazon would develop this idea into something that we hoped could make our Glastonbury very special. 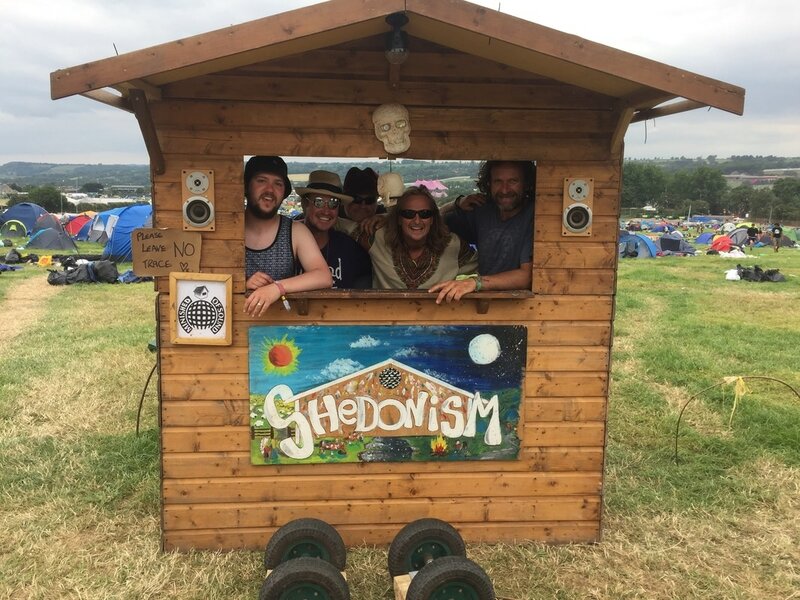 It wasn't until the final week, when the three of us held a last minute meeting to discuss how we would get this Shed into Glastonbury. 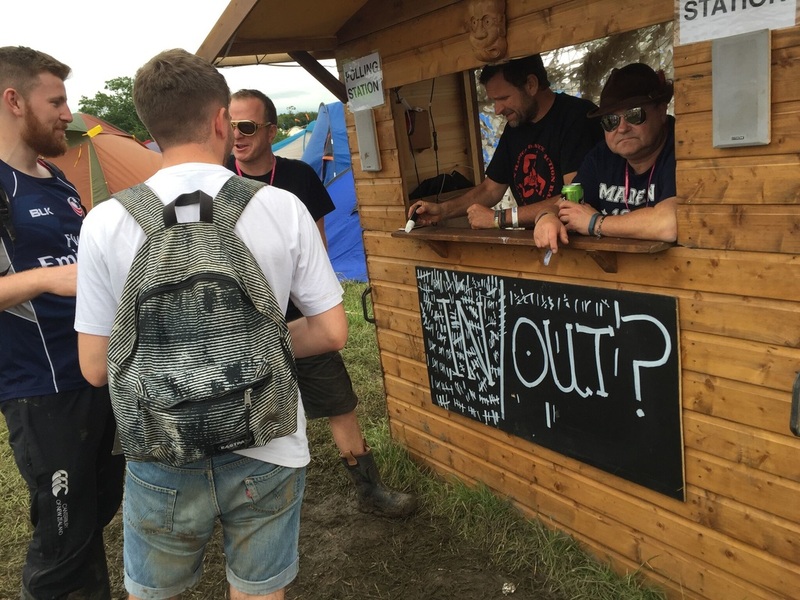 Now Glasto is one of the last festivals where you can literally bring what you like into it - however there is a risk that the security may find this too big or the fact that many stalls pay a lot of money to be there in order to sell, and this could be seen a a kiosk of some sort - so some guile was needed. The shed would be flat packed and smuggled in on 3 large garden trolleys. That last meeting proved crucial as the cunning plan to turn it into a Polling station was hatched. 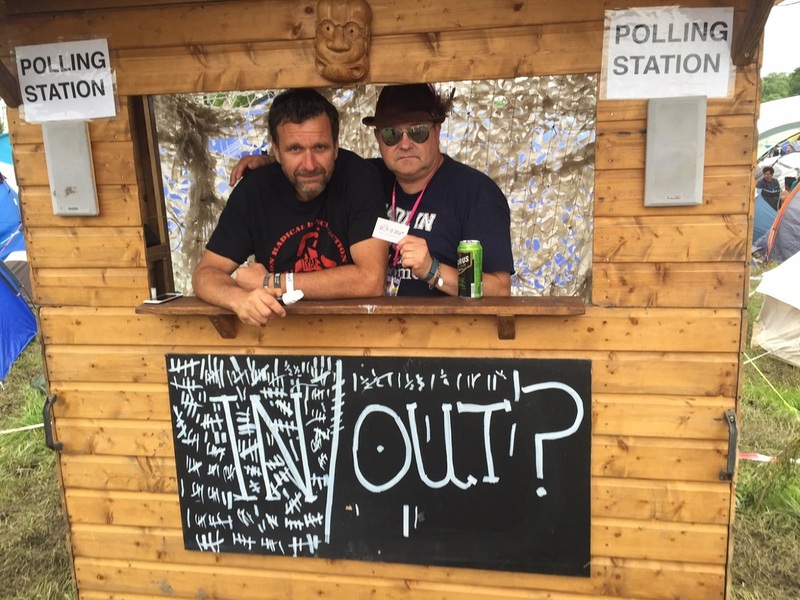 The wonderful government had only chosen the Thursday of Glastonbury to hold a referendum on the EU and that happened to be our Belly Button referendum too - In or Out. ​Roy had time to say hello and good bye to his loving kids before rushing over to Reggies for final preparations. 3 Hours of hard pushing, pulling and we arrived back at our temporary home for the next 6 days. It only took 30 mins to assemble, a tried and tested method on a few dry runs in Reggies garden. The solar panels on the top of the shed pulled in the suns power and stored it in two large batteries while they in turn supply power to charge over 10 phones at a time and still have some to bang out the tunes and lights of and evening. Wednesday night fell quickly and before we knew it we were in the craziest clubbing area in this amazing city, Block 9 and the clubs that are around that magical area. Returning at day break for a rendition of ‘If you want to build a shed”. ​and doing a great job serving the comunity! 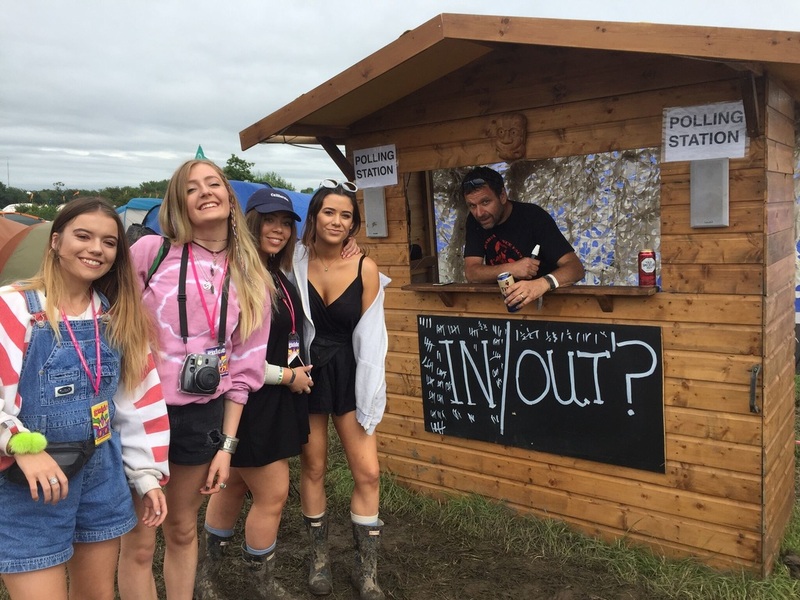 "you only see imidiate connections with tents that are almost on top of your own, that was as far as the community within the camping fields seemed to spread and every year we left wondering why the Eavis’s would even think about doing this again given the disgusting devostation that is left every year "
At Glastonbury 2015 we were lucky enough to camp next to a village green, a scheme piloted last year in order to spread a message of community within the camping fields and send out a message to prevent almost ONE MILLION pounds being spent on the huge annual clean up. We expirienced first hand, the community spirit amongst the nearby tents, using the small open areas to meet and greet neighbours and passers by. Hand made benches and decorated in willow arches made it feel warm and welcoming. A great way to start the day with a cup of tea and a chat to our neighbours. Even passers by would exchange greeting throughout the day / weekend. Without a doubt it contributed towards more personal rubbish taken away by the nearby crowds as the message of 'Leave no Trace' was promoted to the many that visited the areas. The 'village green project' we expirienced last year was the main motivation to get in early again this year and pitch ourselves within their neighbourhoods. By the time we arrived on Wednesday morning on Pennards Hill and it was filling up fast – and we could see the village greens had not been fully completed – Just red and white tape marked out the areas joined by narrow taped lanes - it was obvious from the start that these valuable real estate areas will be filled with tents if they were not shown to be 'cared for' areas. Tents were spewed from ruck sacks and speed out in a bid to claim their spot. Many bemused campers stood in the middle of our local green and you could see the cogs working "what a great spot to camp" - we informed a few of the reason this area was 'unclaimed' and they set about looking for that precious bit of field they could call home for the next 5 days. We pitched our tent and set about helping our village green members. Danny and Sean explained how last year there were 120 members dedicated in making the village green project work, and that this year in the Pennards Hill Field they were down to just SIX! We helped ourselves to the willow piles and set about erecting the large willow archways that indicate the willow fenced pathways towards another village green and so on connecting the field with easy access to far reaching areas of the field. These vast areas of tenting suburbia are difficult to navigate and I amongst many have experienced the nightmare of trying to find ones tent in the middle of a sprawling mass of similar dwellings. Yet these willow flanked walk ways allow even the most unstable partied out reveller easy access to the most central areas of the field without stumbling over hundreds of guide ropes along the way. The village greens now decorated in large archways were given the final touches with coloured ribbons, seating was made from logs and wood piles Glasto organisers leave for fires and furniture. This gives every one that passes through the chance to stop, rest and take a seat , this year the need was even greater with the endless mud giving no opportunity to take the weight of ones tired feet. This years village green became a hub of activity throughout the weekend – in fact on Thursday as the rest of the country hurriedly entered polling stations and cast their vote on the biggest desision of a generation – The Referendome , we conducted a poll on Bellybuttons from The shed that we smuggled in - to be used by the community surrounding the village greens – Disguised as a Polling station the vote was simple - In or Out. ​A few confused faces soon turned to smiles as everyone who passed through the village green voted – many were happy to reveal their voting stance and others were blatantly on show for the world to see. Outies were not so popular and did get an awkward reception every time one was revealed. A landslide victory to the innies was declared the following morning – a fire was kept going throughout the weekend even when persistent rain threatened to spoil the festivities. As the Fire from Arcadia lit up the night sky in the early hours of Monday morning people still sat and chatted about their Gladtonbury, keeping warm by the fire listening to a few mellow tunes from the ‘Minished of sound’ ! he social message got through and as we left on the Monday afternoon you could see a huge diffence in the carnage that is normally left. Vast areas of green grass once again exposed, bin bags full and deposited at the large dumping areas along the roadways – recycling bags full and even those who really don’t want to use their tent ever again, packed away and givin in to the many collection points that donate to third world charities – all in all a huge success in our opinion and something I hope continues, within a few years the message will spread amongst the camping communities. I've got a Frank Zappa DVD and on the cover it asks "can you mix comedy and music? ", and watching Frank Zappa I've never been totally convinced that you can. But MIK Artistik proves otherwise. Come and see for yourself. It is truly a wonderous thing to behold. With really good support too coming from the best signed singer song writer in Brownhills, Chris Whiting and Friend. Plus DJ Lighty and others. There might even be a light finger buffet as well.